Sage, a market leader in integrated accounting, commercial and sales management solutions, and Finexkap Group, the foremost non-bank financing platform for cash flow management for small and medium sized businesses, announce their partnership for the launch of ‘Sage Clic&Cash’. The aim of this partnership is to give businesses a real alternative short-term financing solution. In France, a business dies every 33 minutes due to cash flow problems. Two thirds of them are victims of delayed payments. Despite efforts by successive French governments to counteract this problem, delays to payment remain too high and continue to penalise business competitiveness. By joining forces, Sage and Finexkap Group have demonstrated their shared ambition to reduce the 600 billion euros of credit owed between businesses—without having to involve banks in the process. Sage Clic&Cash was born out of this complementary partnership. As a brand new solution for financing cash flow issues flexibly and easily, it aims to help small and medium sized businesses which face liquidity constraints. 600,000 business users of Sage can now create a Sage Clic&Cash account in order to benefit from the service, using the accounting software interface ‘Sage’ or ‘Ciel’. In just one click, they can then request a cash flow advance from Finexkap in return for invoices that are awaiting payment from clients. After a careful analysis of risk history and the commercial relationships involved, using algorithms developed using a fintech platform, they can receive a financing offer in less than 48 hours. Another major innovation of Sage Clic&Cash is that it brings an incomparable fee structure into the arena of alternative finance. The attractive cost of the service can be adapted and evolve according to specific business needs. Including all commissions, an annual charge can be as low as 3.7%. By offering new technology to a wide variety of companies, the fintech has entered a new phase of maturity. Sage Clic&Cash represents a break-up in the current structure of short-term financing, by making this process smoother and adapting it to meet either the one-off or recurring cash flow needs that result from business size. “Having credit trapped between businesses is a systemic problem which significantly changes the health of French businesses and the economy in general. We think that digital technologies will succeed in that area, where regulation has reached its limits: real-time analysis of data allows for a calculation of risk which is fairer and gives a boon to the availability of short-term financing at a competitive cost. The simplicity of using Sage Clic&Cash and its fast process of transferring funds has democratised access to this type of financing and resolves the problem of late payments. The partnership between Sage and Finexkap is an alliance of expertise and data management, which uses an innovative approach to create alternative financing. Put simply, it is a 100% digital alliance”, says Claude Cordier, Director of Product Marketing at Sage. “We have created Finexkap with the aim of facilitating access to cash flow for businesses. Thanks to the role of technology, in as little as 18 months we have already contributed to the financing of 50 million euros’ worth of invoices. Our partnership with Sage is built out of the heart of our strategy of ‘network lending’, the purpose of which is to connect our service to software that combines information relating to credit held between companies, notably commercial management and accounting software. 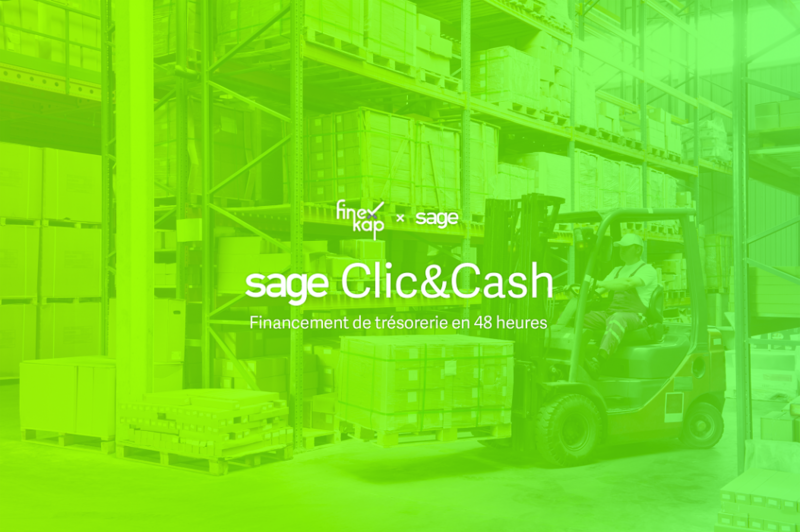 Thanks to the strength of Sage, the market leader in business management software, several hundreds of thousands of small and medium sized businesses will now benefit from financing at a click in order to meet their cash flow problems”, say Arthur de Catheu and Cédric Teissier, founding partners at Finexkap Group. A wholly-owned subsidiary of Finexkap, Finexkap AM is a portfolio management company regulated by the French Autorité des Marchés Financiers (AMF) under the number GP-14000044. Invoices submitted on Finexkap’s platform are purchased using refinancing vehicles managed by Finexkap AM. Sage, the market leader in solutions for integrated accounting and commercial management, payment of salaries and online payments, supports the goals of entrepreneurs around the world. Created 35 years ago, today Sage has more than 13,000 users in 23 countries representing millions of entrepreneurs who are the engine of the global economy. We reinvent and simplify business management using cutting-edge technology and through collaboration with a dynamic community of entrepreneurs, managers of start-ups and small and medium sized businesses, retailers, accountants and software developers. As a FTSE-100 entity listed on the London Stock Exchange, Sage makes support for the local community its priority, through the charitable activities of Sage Foundation.